I’m relenting briefly from my self-imposed round-up hiatus to bring you two music videos that appeared today. The first is from Poland’s Decapitated, for the song “Instinct” from the Blood Mantra album, which is out now from Nuclear Blast. The second is from the UK’s Bloodshot Dawn. The song is “Smoke and Mirrors” and it will appear on the band’s next album, Demons. Both videos are after the jump, preceded by a bunch of links. That Decapitated song was one of the stronger ones on the album. I dig it. But Bloodshot Dawn TOTALLY overshadow them. HOLY MOTHER OF FECK, “Smokes and Mirrors slays. Makes me glad as hell that I contributed to their Kickstarter. Can’t wait for the full album. 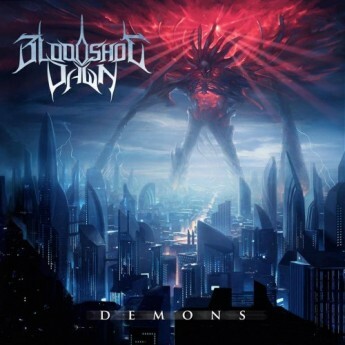 It’s a good song… and they’re a good band… but (and this consistently surprises me) I’ve never fully gotten into Bloodshot Dawn. And on paper it seems like exactly the sort of thing I would love. But for some reason they just don’t “click” with me, and I don’t know why! It’s that mutated chromosome, you know the one I mean. Now i’m not saying they’re bad (they’re clearly VERY good)… I think it’s just the vocals. They’re just not grabbing me… i’m noticing a lot that, regardless of particular style, if the vocals don’t hook me in then I don’t always connect with a band fully. I quite like the new Decapitated album. But that Bloodshot Dawn is some serious melo death glory. Love that Bloodshot dawn track. The melodies remind me a bit of older Mercenary. Good stuff.